One of my favourite little boxes to receive each month is my monthly bellabox* subscription box. This Australian operated service delivers a little blue box of around 5 beauty products within Australia and New Zealand and they always include a wide range of different brands, some you may be familiar with, but also some that you may never have heard of. Each month is a surprise, although they do give you sneak peeks and sometimes you get to chose a particular shade of a certain product. For the January 2019 box, the theme was Happy You Year and inside was 3 full sized products, 2 deluxe sample sizes and 1 bonus sample sachet which is the Nutrimetics BB Creme Skin Perfector. 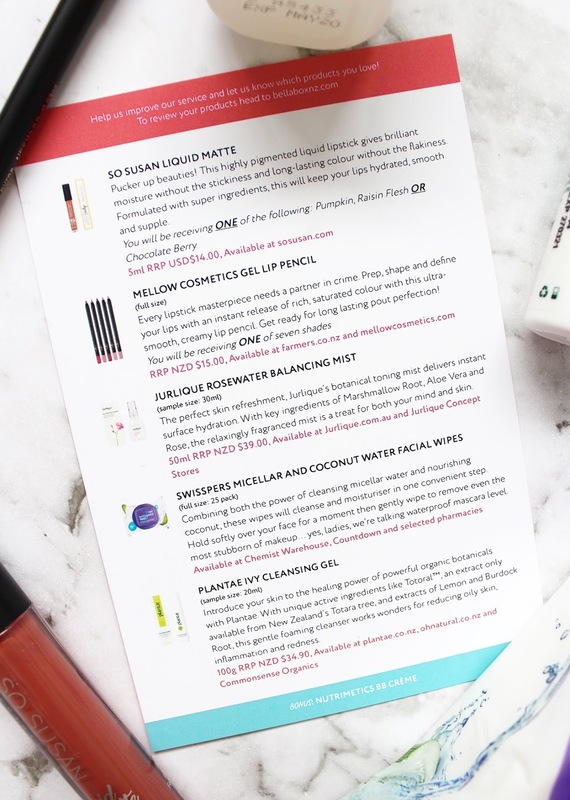 I have only ever heard about this brand in beauty boxes before - it's a strange one but it looks as though they've repackaging and really stepped up their game a bit more! There were three shade options that you could receive including Pumpkin, Raisin Flesh or Chocolate Berry. The shade Pumpkin is thankfully not bright orange but is more of a burnt orange with a rosy tint to it. The formula dried down matte super quickly in my swatch and the formula was smooth and even to apply. I love lip liner and have heard great things about the Mellow ones. From the first swatch, I was impressed and put it on my lips right away. It's got a very creamy consistency and is very easy to apply, it also didn't budge while I was wearing it. You could receive one of seven shades, and I am so glad I got Harper as it is the sort of tone I love and seem to suit quite well. During the summer, a mist is exactly what is needed. This one acts as a toner with key ingredients of Marshmallow Root, Aloe Vera and Rose. This 30ml sample size is perfect for travelling with and provide enough of the product to really get a feel for how it will work for your skin. It is always great when bellabox include NZ products for us NZ beauty lovers - I have never tried Plantae before so this cleanser will be a great one to try out and it's designed for oily and blemished skin which suits me. Its unique active ingredient of Totoral (from the Totara tree) is meant to help with oily skin, inflammation and redness. 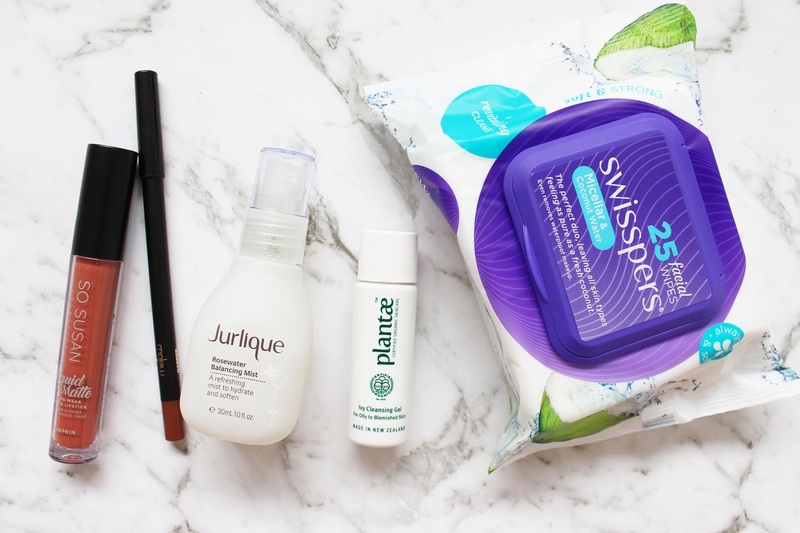 While I don't use makeup remover wipes all of the time, I always need them for wiping off arm swatches and if I am feeling very lazy at the end of the day and just want to get the makeup off my face. I have used Swisspers ones in the past and they were always very gentle so I have high hopes for these ones. It's even better that they have micellar water infused in them. The overall contents value is approx. NZD $74, which is more than double of what you pay for the box (NZD $24.95 a month). It's a great service and they always include well-known brands and it makes for a great surprise in your letterbox each month. Check out their website if you are keen to sign up in either NZ or Australia.